Ruby Velvet™ Anigozanthos is a kangaroo paw with bold red flowers and is one of the most compact mid sized Kangaroo paws available. It repeat flowers in Spring and Autumn, and is more black spot resistant than most Kangaroo paw types. Its vivid ruby coloured flowers are a real highlight in any garden. Ruby Velvet™ Anigozanthos is a relatively frost hardy plant as far as Kangaroo paws go, and will survive in full sun, to light shade. They love free draining soils, but Ruby copes well in heavier soils. After flowering, remove the old flowering stems and leaves to encourage new growth and flowers for the following season. 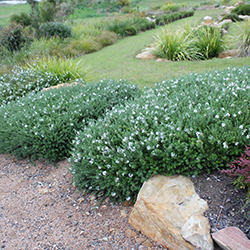 In late winter pruneRuby Velvet™ Anigozanthos back close to the ground, and give it a good dose of Slow release fertiliser. Ruby Velvet™ Anigozanthos red flowers will just add so much colour to any Landscape. Gold Velvet Anigozanthos is a tough landscape Kangaroo Paw with yellow flowers. Its drought and frost tolerance is very high compared to other Kangaroo Paws and it is more resistant to black spot. Gold Velvet Anigozanthos is a mid sized Kangaroo paw. Small ones are too weak and are basically annuals, as they have lots of Annual Cats paw breeding in them. Large ones are tougher but they are too big for Landscaping. Gold velvet is tough like the big ones, but more compact. Gold Velvet Anigozanthos is repeat flowering, and will flower much of Spring, summer and Autumn. If you want really nice paws, trim the older spent flowers off and you will get more repeat flowering. In Late Winter prune Gold Velvet Anigozanthos back close to the ground, and give it a good dose of slow release fertiliser. For a reliable Kangaroo paw that flowers for much of the year and only grows just over waist high its worth including Gold Velvet in your landscape.